Welcome to the September edition of The Book Review Club. We're glad to be back following our hiatus and have lots to recommend after a summer of reading. We never know from month to month who will choose to review in which genre. It's always fun to see if there's a pattern. This month, we have more reviews of adult fiction and nonfiction than of young adult/middle grade. Must've been something in the water, I guess. Enjoy! I don't often read a book from the self-help shelf. But in August, I had an interesting chat with someone who is physically disabled. She described the accident at age 25 that broke her neck, the rehab for learning to walk again, the return to college for a new career. "I met a lot of depressed, bitter people in rehab and decided not to be that way." It was the word "decided" that grabbed me. This person consciously decided to be happy. I thought back to my twenty-something self, to a time when I was profoundly miserable (relationship, job and grad school angst). Could I have chosen to be happy or, at least, less unhappy? Maybe? 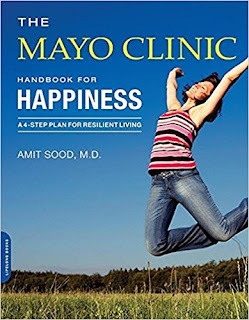 And this is how I ended up reading The Mayo Clinic Handbook for Happiness. In a nutshell, Dr Sood divides brain activity into "focused" and "wandering." When we're in the default wandering mode, which is over 50% of the day, we stress and worry and drift toward depression. I swear there are days when my brain wanders 90% of the time! Social media has only worsened the condition. I could join Wandering Brains Anonymous (if such a group exists)! 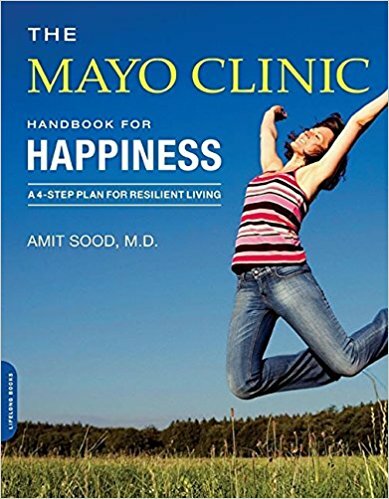 The Handbook for Happiness is a four-step, 10-week program. The steps are: Train Your Attention, Cultivate Emotional Resilience, Start a Mind-Body Practice, Pick Healthy Habits. Each step comes with a series of exercises. For eg., Cultivate Emotional Resilience (weeks 3-8) provides strategies to "refocus thoughts" away from stress. Does this all sound a little simplistic? Yes. Maybe. But, yet, yet, there could be something to it. Something important. We all know if you want to improve at a skill, you need to practice. On some level, it makes sense to practice being happy. I think the book is worth the read. I love the "Food for Thought" maxims, such as "A step back is often a move forward." I'm going to try some of the exercises.